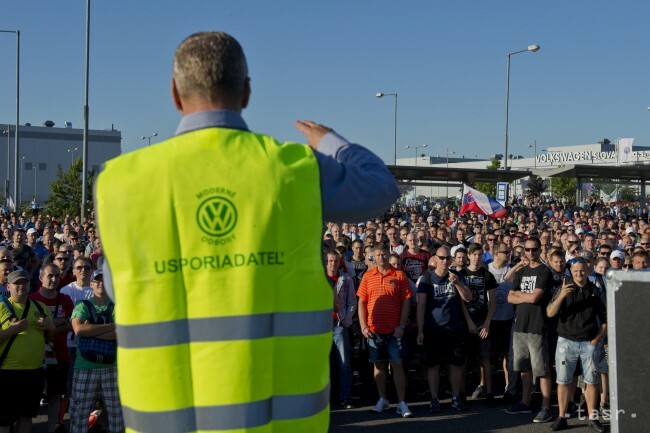 Bratislava, June 26 (TASR) – The strike that took place at Volkswagen Slovakia last week was unnecessary, as the new collective agreement has basically returned to the company’s proposal from April, stated Volkswagen Slovakia management (VW SK) at a press conference on Monday. The trade union argued that only thanks to the strike will the workers see salary hikes of 14.12 percent in total. 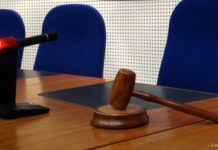 The management at the press conference presented the longest collective agreement in terms of its validity in the history of the company, which has been settled between the trade union and the management following six days of striking. The new agreement is valid from this month until August 31, 2019. „With this longest collective agreement in the history of the company, we’ve created and secured a long-term perspective for our employees and for our company. The hikes will be provided within 27 months in three small actions,“ VW SK Managing Board chairman Ralf Sacht. The new agreement features an increase to the workers‘ salaries by 4.7 percent as of this month, by another 4.7 percent as of January 2018 and by another 4.1 percent between November 1, 2018-August 31, 2019. „With this solution we’ve returned to our own proposal from April 2017, so from the pre-strike period. And thanks to the extremely long contract duration we’ve been able to plan three smaller increases in workers‘ salaries,“ said VW SK board member for personnel issues Eric Reuting. 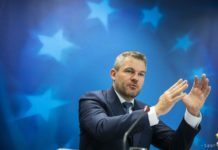 Volkswagen Slovakia’s Modern Trade Union (MOV) denied the claims that the final agreement is similar to the company’s proposals from April. MOV chairman Zoroslav Smolinsky stated that the first offer by the management from January involved an increase to the workers‘ salaries by 1.7 percent. Later in April the offer went up to 4 percent, plus another hike of 4 percent and another 4 percent between July 1, 2017-June 30, 2020. Subsequently, the offer improved the day before the strike and it went even higher after two days of striking. Smolinsky went on to say that the negotiations intensified significantly after five days of striking. „Going up by 14.12 percent within the period of two years is a perfect hike. It’ll cause increases in the average salaries as well, which further influence other things, such as holiday or Christmas bonuses. 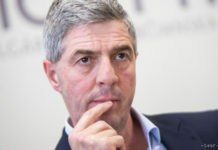 We’re very satisfied with this result,“ he said, adding that all workers will also receive a one-off payment worth €500 this month. According to VW SK, the agreement was settled partly thanks to the fact that the trade union has changed its negotiating team. „Naturally, we’re sorry that this unnecessary strike took place. This agreement highlights our attitude that we do not only offer good salaries and conditions, but we also ensure that our employees will have jobs also in five and ten years,“ said Sacht. Some 8,500 people joined the strike at the plant, while around 5,500 of them took part in it on the first day (Tuesday, June 20).